Thanks to everyone who came out to the Creech comeback show, was an awesome night and great to see so many friends once again. Props to DLG and The Humanz… and big props to Taz, great to see ya back on the mic after defeating the cancer, you’re an inspiration! Also, it seems that some of you are heading to Ruby’s tonight. It’s gonna be a great night of Australia’s finest new hip hop talents with Hills Hip-Hop, but I hope you come down next Saturday as well when Adam, Marki and myself will be rocking out with the mighty Dusted Orange. See you there on Easter Saturday! After winning his fight with cancer, lead singer Taz is back on stage again with the pure rock mayhem that is CREECH! This celebration of life, triumph and rock n’ roll will also feature DLG, Nitidus (Adam, Marki and Doc) and The Humanz. 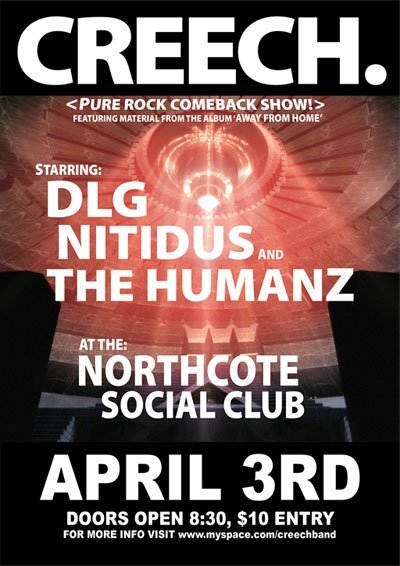 Get down to the Northcote Social Club (301 High Street, Northcote) at 8:30pm on April 3rd for all the action. Only $10 at the door, and 10% of Creech earnings from the night will be donated to the Cancer Council, so not only will you be supporting local talent, but donating to a good cause. Spread the word, and we’ll see you at the show! 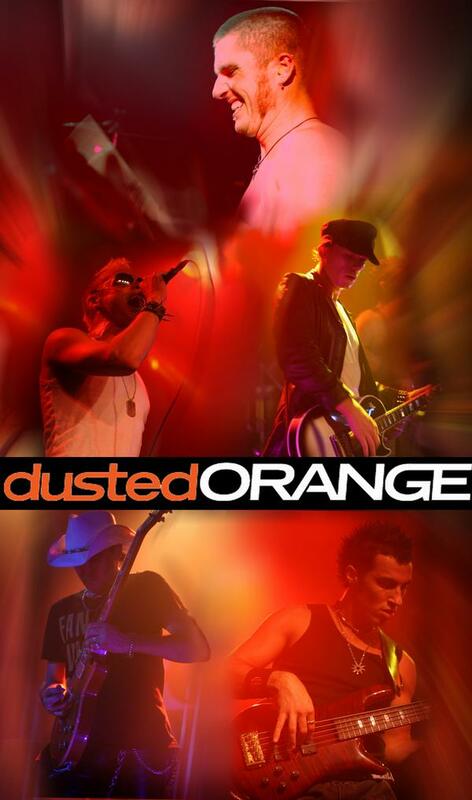 Nitidus and Dusted Orange unite for a rock enslaught! UPDATED: The Ruby’s gig is now on the 11th of April, not the 4th of April as mentioned when this post was first published. Apologies for any confusion. Get over to the John Curtin Hotel on Lygon Street this Thursday night for a heavy dose of rock, served by our good friends Dusted Orange, Teaza, plus The Rock City Riff Raff and us (Adam, Marki and me). The bar opens at 8pm, and be sure to bring an extra $8 for the lovely door girl so she can keep the staff paid and the venue open for many more nights of fun. Also, mark down 4 April 11 April on your calendar, when we will join the mighty Dusted Orange once more to rock Ruby’s Lounge in Belgrave. There’s one more show in April to announce, but I’m still waiting for details and confirmation, so stay tuned. As a teaser, let’s just say it may involve the triumphant return of Melbourne rock heavyweights Creech! Exciting times ahead. See you on Thursday. Sorry folks, but it seems that Musicland was double booked on Saturday 23rd February, so unfortunately they’ve had to cancel our show with Daddy’s Little Girl and Creech. We’re negotiating for a replacement show, possibly to be filmed for Asylum TV, so stay tuned for more on that. Don’t worry, we’ll still be performing with Noiseworks and Choirboys on Saturday 1st March, so grab your tickets today! 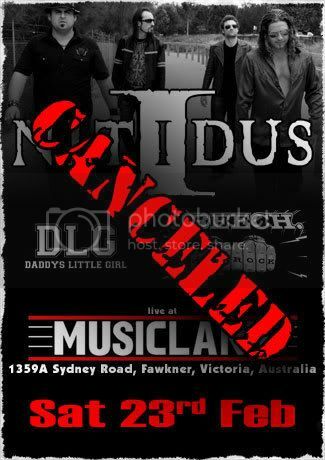 The Nitidus rock show is back! 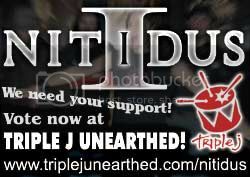 The Nitidus rock show is back at full power in 2008 with two massive shows. First up, the boys will join Daddy’s Little Girl and Creech to rock Musicland, an awesome venue in Fawkner that has one of the best stages in Melbourne! Be there on Saturday 23rd February for all the fun. 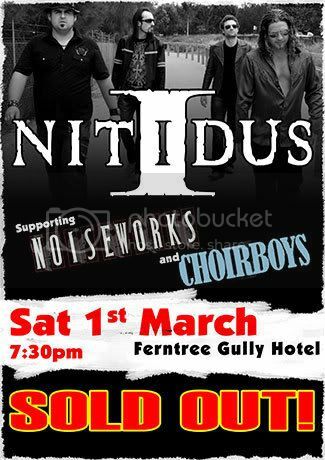 Then on Saturday 1st March, Nitidus open the show for Australian rock superstars Noiseworks (back together after 15 years) and the Choirboys! The show starts at 7:30pm at the Ferntree Gully Hotel. Tickets are on sale now. We’re looking forward to rocking out with you all again for the first time this year. See you at the show(s)!